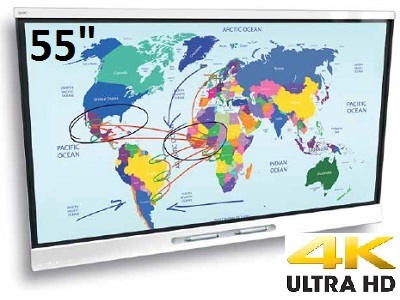 The Smart 6055 Interactive touch panel is the latest product from Smart Technologies, it incorporates a large format 55" commercial Ultra 4K HD LED touch screen with Smarts Interactive Notebook software. The 6050 has been designed specifically for classrooms and is a fantastic alternative to the traditional interactive whiteboard and projector. The 4K ultra high definition resolution shadow free display provides optimal clarity and viewing from any angle. Powered by SMART Notebook software Included is the software that teaches the world,optimized for use on SMART interactive displays.Create lesson plans in the same environment you’ll be teaching on. The world’s most popular learning software is made by teachers, for teachers, to inspire students in perfect harmony. Silktouch Technology - The most accurate, natural, and responsive touch experience from corner-to-corner. Fingers glide effortlessly over the surface,n providing hours of error-free use in perfect comfort. SMART ink™ technology - Writing is natural and looks better with SMART ink. Whether you’re using a pen or finger, each stoke is a work of art. Its realistic digital ink improves legibility, so teachers don’t have to re-write and students feel confident contributing. Pen iQ™ - Students can see their contributions free from interruption by their partner. Using different colored ink, you can write independently and simultaneously in any lesson activity to open new collaborative opportunities. 4K Ultra HD resolution - Durable commercial-grade, glare-free LED panels display brilliantly detailed 4K Ultra HD images and text (3840 x 2160 pixels). Crisp content clarity and readability keeps students involved no matter where they’re seated in the room. Object awareness - You already know how to use it. Offering the most intuitive experience by automatically differentiating between a finger, pen or palm, do what comes naturally. Touch, write, erase. Simplicity at its finest. The first dedicated Educational interactive flat panel featuring Pen ID allowing for 2 users to collaborate seamlessly or work independently. Each user has independent control over the colour of pen they are using which opens up new ways of interacting. This feature is available exclusively with the SMART Board 6065 interactive flat panel which uses SMART proprietary DViT (Digital Vision Touch) camera based technology. Simultaneous touch points - With 4 simultaneous touch points, on Windows or Mac, multiple students can use gestures, like zoom, rotate and flip, at the same time. The natural learning experience develops essential life-long collaboration skills without students realizing it.